Performers include: Keri Russell, Matthew Rhys, Maximiliano Hernández, Holly Taylor, Keidrich Sellati, Noah Emmerich, Margo Martindale, and Richard Thomas. This period drama takes place in the early 1980s, shortly after Ronald Reagan was elected President. 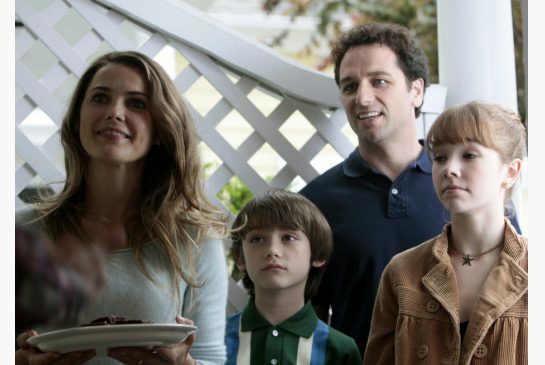 Philip (Matthew Rhys) and Elizabeth Jennings (Keri Russell) are a pair of KGB spies who live in a suburb of Washington DC. They are married and have two children — 13-year-old Paige (Holly Taylor) and 10-year-old Henry (Keidrich Sellati) — who have no idea about their parents’ secret identities. Philip and Elizabeth are in an arranged marriage but it’s become more passionate and genuine as time has passed. Their relationship however is constantly tested — by the escalation of the Cold War and the relationships they must maintain with a network of spies and informants under their control. Complicating their relationship even further is Philip’s growing sense of affinity for America’s values and way of life. Tensions also heighten upon the arrival of a new neighbor, Stan Beeman (Noah Emmerich), an FBI agent. Stan and his partner, Agent Chris Amador (Maximiliano Hernández), are members of a new division of Counterintelligence that’s tasked with fighting against foreign agents on US soil — including KGB Directorate S illegals (Russian spies posing as Americans). The Jennings face a choice that will change their lives forever. What do you think? Do you like The Americans TV series? Do you think it should have ended or been renewed for a seventh season? We need more seasons. Lots of story lines available!